Ready for the farm tour! Today we welcomed McKinney to the farm. 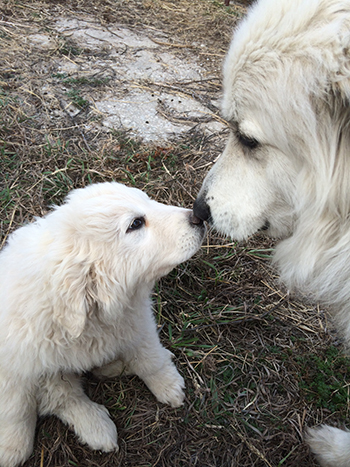 She is a great Pyrenees, as is her mentor, Scoop. It will take her a few weeks to get used to the farm and her new family, but we are excited to have her here. People sometimes ask if our livestock guardian dogs are good herders. They aren't. In fact, that's a completely different task. Instead, guarding dogs are supposed to bond well with the animals that they are guarding. They stay with them at all times, and let predators know not to come close. Scoop sleeps all morning because he is alert all night. Sometimes he chases coyotes away, but he also spends a lot of his time next to the goats, barking or emitting low howls to tell predators to stay away. Over the next several months, McKinney will learn to do the same thing. 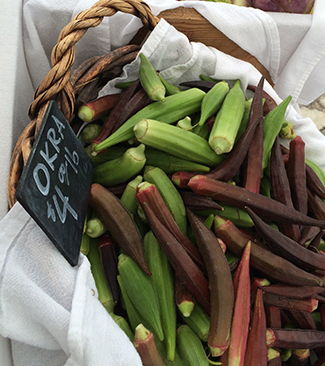 Okra always seems to be the vegetable that people either love or hate — not much room for something in between. What’s your favorite way to prepare it? We’ve had fans of pickling it, frying it, steaming it, putting it in soup, and even stuffing it with a hot pepper mixture and baking it.